The Cascades community is a small development of very nice ranch-style homes, located off Hwy 17 Bypass between Market Common and Hwy 544. The neighborhood is immaculate, with landscaped lawns and lots of flowers. Homes are three or four bedrooms, with average sized lots, and custom add-ons from backyard pools to extra large garages. They range in size from about 1900 to 2600 sq ft, and are priced anywhere from the low $200,000's to about $300,000. Some were built around 2005, and some are newer. The development is well established. Several lakes are located in and around the Cascades, and other small developments border lakes on the other side of the road. There are no community pools or other amenities, so the HOA fees are very low. It is outside the city limits, so taxes are less as well. Kids will attend Lakewood Elementary, Forestbrook Middle School, and Socastee High School. 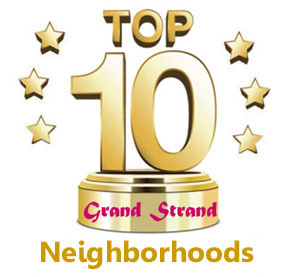 The biggest draw to this community is the proximity to Market Common and Surfside, with several golf courses, the Myrtle Grand Mall, and Broadway at the Beach a few miles north. Many of the homes will have a nice view of the ponds, lakes, and their fountains. The Cascades will appeal to someone who wants a nice neighborhood with no frills and no extra expense. If this sounds like you, call us to see some of the available homes in the Cascades.